Aim for a black belt jackpot in Hanzo’s Dojo, a martial arts-themed video slot from Yggdrasil Gaming. It’s a 5 reel, 25 payline game that comes with a good range of extras including expanding wilds, colossal symbols and free spins with bonus boosters including wild reels, nudging symbols and multipliers. Play on your desktop, tablet or mobile from between 25p and £125 per spin. As usual for an Yggdrasil Gaming release, the design in Hanzo’s Dojo is nicely crafted. The reels are set within a traditional Japanese building. The top symbols are the quartet of martial artists. You’ll see a fan fighter, sumo wrestler, ninja and samurai warrior spinning around the reels. Very impressive it all looks too. Expanding Wilds feature – if a wild hits on 1of the 3 positions in the Rooftop Slot, it will drop down and turn the whole of the reel directly underneath wild. Hanzo Spins feature – these can be triggered in 2 ways. Land a combination of 3 Hanzo symbols and expanding wilds on the Rooftop Slot and you’ll receive 3 free spins with a colossal 3×3 standard symbol. If you land 3 expanding wilds from the Rooftop Slot, you’ll also receive 3 free spins, this time with a colossal 3×3 wild. Win Both Ways – winning lines can be made from right to left as well as from left to right. 3×3 Symbol Nudge – colossal symbols can nudge up 3 positions to create the best possible winning combination. 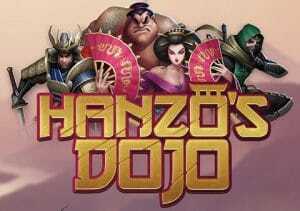 At first glance, Hanzo’s Dojo looks like a rather complicated game. It’s not really but a few spins in play mode are recommended until you get accustomed to the unusual set up. Once you have got used to the Rooftop Slot element, you’ll find plenty to enjoy here. The design is up to Yggdrasil Gaming’s usual standards and there’s an excellent variety of extras on offer thanks to the boosters in the Free Spins feature. Finding a fresh take on the classic Asian-themed video slot isn’t easy but in Hanzo’s Dojo, Yggdrasil Gaming has managed to do just that. I also recommend you try Penguin City which is just oddly brilliant.